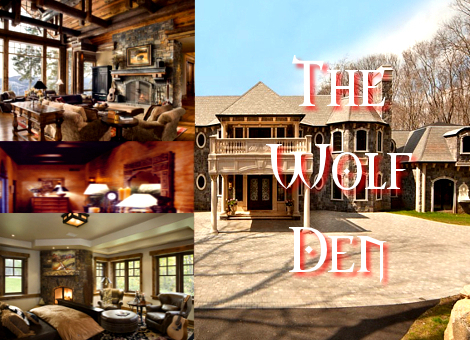 Category Archives: The Wolf’s Den. Posted by charlottecarrendar in The Wolf's Den. “YOU USELESS PUGS!” Marcus’ voice rang through the house as he hollered at the top of his lungs at a few of his wolves. The rage in his voice showing the rage which took his heart and mind. The reason? This team of wolves, who specialized in subtelty, were sent to the Vampire Coven home to investigate whether or not a part of his pack who had gone missing, were in fact abducted by the blood sucking panzies. The wolves were attacked not far into the compound, and retreated rather than stand their ground and fight. “You are weak! You are stupid! You are foolish! And you are full of cowardice! Were this Rome, your life would be taken where you stand!” The three beings before him smirked, and one rose up in words. “Marcus, they outnumbered us ten to one. We had no cho-” His voice cut off as Marcus shifted to his wolf form almost instantly with a loud roar. His hand gripped the other’s throat and lifted him high. Deep growls could be heard escaping his mouth and bared teeth as his mind relayed his message. “You are trained in combat by a King of Rome! A Legionairre! The BEST OF THE BEST! You do not run in the face of defeat! You stand and fight!” With each emphasized word, a bark was sounded. “You EVER run from the enemy again, I will personally take you to the enemy base, and allow them to tear you to shreds!” He pulled him into his snout. “I hope, you learn from this….” MArcus practically threw the man on the ground, and growled, his his eyes falling to his naked and furry body. “Leave” he spoke to them telepathically, and the three left as fast as their legs would carry them. Marcus roared again, and in an attempt to calm his rage, fell to all fours, darting off into the woods which met the back gate of his coven home. Leaping over the gate in a single, simply leap, he darted full speed straight ahead. It didn’t take too long for Harriet to reach the main house of the Wolf’s den, where she had heard the raised voice of Marcus, who was telling off his team of wolves. His pack. Harriet pulled her hoodie down lower as she entered the foyer, seeing the other males there, she always felt different from them. Having been one of Jackson’s castoffs, she was a werewolf after a night where he attacked her and left her for dead. With no where else to go, Marcella had taken her in. Harriet paid her way, so she had a small bedroom up on the second floor. Styled to suit her tastes, she had a sanctuary within the den, but…she feared getting in the path of Marcus when he was in one of his rages. She knew he had taken off into the forest, probably to calm himself from whatever his pack did to damage the Pack’s pride. Harriet had half a mind to go out and let the Moon do its work, to turn her to the werewolf she was, but then she might stray into Marcus’s path, and he could end her. Entering her room, Harriet slowly peeled off her hoody and went to hang it up in her closet. She was still wearing her work overalls, and smelt of grease and car parts. Taking out the band that kept her hair bound up, she started to strip off slowly, heading for the bathroom, so she might shower before dinner. Washing away the oil and grime that came from working at the Garage, was a glorious feeling. Standing under the steady spray of hot water, Harriet’s hair flattened to her head and down off her shoulders, as she ran her hand over it, smoothing it back. Using a bar of handmade soap from in town, she lathered herself up well, and scrubbed her body clean, her skin invigorated from the oils in the soap bubbles. Harriet placed the bar of soap back up in the holder, and then washed her body clean, rinsing herself, before finally turning off the taps. The steam from the shower cubicle had filled the bathroom, fogging up Harriet’s mirror, which she wiped in a circular motion with her hand, so she could see her reflection in the mirror. She gave her head a good shake, with the spray of water flicking about her, getting droplets all over the floor. Without the makeup, and her hair wet, she looked so young and fresh. Harriet leaned forward and grit her teeth, making a growling sound, reminiscent of what she sounded like out in the forest. One of the joys of being a werewolf, was being able to run free under the light of the moon. Unlike the others in her pack however, she couldn’t change at will, and this was something of a problem. She was half tempted to approach Marcus, the Alpha of the pack, and ask him how to control the wolf within her. But again, she was timid, and didn’t want him to think she was wasting his time. She wasn’t timid with everyone. Harriet did have a temper, especially whenever she saw Jackson. Oh how she hated him. Arrogant, self centered meat head. She had a few other choice words to describe him, but she didn’t let her anger flare in front of Marcella, especially after all the Queen of the Alpha wolves had done for her. Harriet picked up her brush and started to comb it through her hair, staring at her reflection as she did. She wasn’t unattractive, but she was shy to get involved again, especially after Jackson, and becoming a werewolf. Its not an easy thing to accept in a person, or new lover. She was dangerous, and she knew it. Placing down the brush, she wrapped a fluffy towel around herself, and padded back out to her room, where she would rifle through her cupboard for something to wear. She ended up choosing jeans and a Black tank top, and black scuffs. Harriet was dressing for comfort, more than anything. Ready to join the rest of the pack, if they were home, she headed out of her room, and went down stairs, to see if there was going to be a meal served this eve. Biting her lower lip in deep concentration, Marcella began making slow, gentle strokes with the paintbrush she had steadily in her hand. Blonde strands occasionally getting in the path of her vision, but she would carefully brush them away and behind her ear. It was strange to see her painting right now, it was actually a wonder why she even thought of doing this to begin with, then again, she was trying to perfect something she’d dreamed up. Slowly… She mused, taking her sweet time as she painted the beautiful crimson across the material. Exhaling as gently as possible, thinking of this task she was involved in to be the most important thing in the world. Then, she heard it. His harsh voice had broken through the air… and had broken her concentration completely. Her body suddenly turning away from her “art,” though the paintbrush just managed to swipe straight across the painting, ruining it in the process. “Marcus…” She brought out with her hushed voice. Things had not gone right, that was obvious. Not letting her mind think on it too much, she knew exactly what he was doing now, since an odd silence crossed the entire home. It was better to leave him alone for now, at least until he calmed down. However, it was the lingering emotions from the one she felt so much for that had caused the next scene to happen. Within a flash, the crimson colored painting had hit the floor, her body falling to the ground as she stared blankly at how ruined it was now. She blamed no one but herself, which only made her grow back into a rage, the paintbrush in her hand was ripping straight through the material, destroying the painting further. Till there was nothing left to be shared, her hands covered in the paints, she stepped away from the mess without a word. Her full being composed while she edged toward the sink in order to scrub her hands clean. Once that was finished, she dried her hands, then created her path to select something more suitable to wear. A fine dress. It was colored in one of the many shades she had been using to paint with moments earlier. Discarding the pieces of her project, Marcella took the liberty of putting away her stained clothes after, it was her fault… so she would take care of it. Glancing around the bedroom with a pleased look on her face, she headed downstairs at last, the door shutting behind her as she went. Smoothing out the front of her outfit, the woman looked up right when her feet reached the flat ground. Almost immediately spotting Harriet on her way down. Managing a light smile directed in her path, she spoke no words, but headed off in a certain direction to check on something. A minute or so passed and she returned, having full knowledge that their meal was going to be served soon enough. “Hello, Harriet.” She finally greeted her, the usual expression displayed on her facial features as she watched her closely. The man of the house leapt over the fence once more on his return. His fur covered in fresh blood. His teeth marked with the same crimson as his fur and claws. there had been a rather unlucky couple that graced his presence, and they paid for it with their lives, though, the event managed to calm the Alpha Wolf. Slowly he padded through the yard, his eyes and mind in a much calmer state than when he left. Opening the door to the house, he stood on two feet, and made his way through. Being much larger than the other wolves, all except for Andrew, his bloodied body was something to behold. His eyes fell upon his mate and…the female lackey of his son’s misadventures. Harriet. Though he could not speak, he ushered a soft growl to announce his presence, and sort of say…hello…in the most polite way he knew. Though it was more so towards his mate, and not his son’s seconds. Continuing on to the stairs, he climbed them slowly, making his way to the master bedroom, and into the bathroom. Climbing into the shower, he bumped his head on the curtain bar, and threw a massive hand at it, breaking it in two and sending it to the wall. With a huff, he allowed his fur to shed and his body to return to it’s more natural state, even if he felt more at home in his wolf form. Turning on the water, he stood beneath it as the steam filled the room, resting his hands on the wall before him. the water beat down on his body, his eyes closed as it washed him of the blood that had stuck to his skin and not the fur. He ran a hand through his hair, and then over the scar on his well toned stomach, from his death so many years ago. Harriet twirled a stray lock of hair around her finger, as she went to greet the Alpha Queen, only to see her vanish into the kitchen. She was offered a small smile, and Harriet was about to raise a hand, as a form of greeting, but soon drew her fingers back and lowered her arm to her side. When Marcella returned, with a fixed smile on her face, she greeted Harriet with a simple “Hello Harriet”. But it seemed her question was about to be answered, as Marcus entered the room, standing on two legs, and his fur was marred with the blood of a kill. Knowing her place was a lower one in the pack, she bowed and backed up, a small whimper escaping her lips, as she heard his growl of return, though it was his way of saying hello. Beneath her veil of black locks, she watched him climb the stairs slowly, and go up to get showered. Harriet raised her head up slightly, and her face was etched with worry. “I don’t think he likes me very much.” Harriet said, feeling a bit lost at this point. Harriet knew he was irritated. The young mechanic heard him tear up his pack, prior to going out to hunt. His words of condemnation and the loud roar as he changed into his werewolf persona were typical of Marcus’s being. Harriet was in awe of how Marcella could keep a smile on her face. Yes, she saved it for Harriet, and tried to reassure the girl that everything was alright. Harriet respected this, and went to take a seat beside Marcella, so that they could wait together for Marcus to finish his shower and come back down stairs, so that they could head to dinner. Though Harriet had to wonder; would Marcus even be hungry? Harriet brushed back her hair with her right hand, and sighed. She knew Jackson would probably be coming back to the Den soon, and that was when Harriet liked to make herself scarce. Sure, he barely even glanced at her now days, and must be annoyed as hell that she is under the same roof. But….he made her what she is. Most days, she hated him so much, she would try to plot ways to end him…so he could never do this to another, then again, she was now immortal in a sense. She loved being a werewolf, she just wished she knew how to control it.